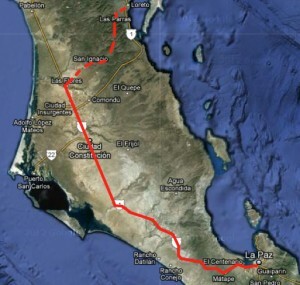 Tomorrow I leave for La Paz on the final leg of this stage of the Tour de Zack (sort of). From here in Loreto it is still another 370 km, 90 km of which is off-road, to get to the city whose name means “The Peace”. I expect the journey to take five days. From La Paz one can get a ferry across the Sea of Cortes to Mazatlan on the Mexican Mainland in the state of Sinaloa. 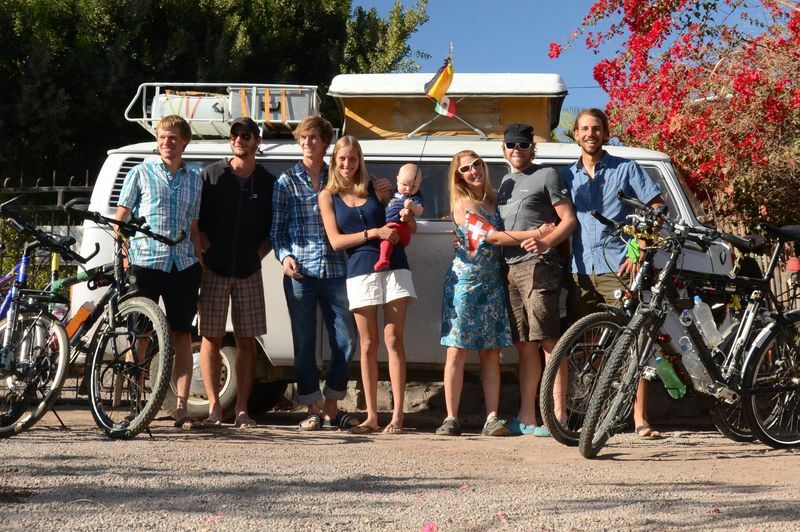 The campground crew in Loreto. From left to right: Felix, Me, Constantine, Anushka, Kilian, Maire, Johan, Karl. Constantine, Anushka, and Kilian are a very young german family driving in the VW van behind. Kilian is 7 months old and has been traveling for 4 months. Marie and Johan are swiss Pan-americana cyclist traveling south. The last three days in Loreto we have been fasting. Today we finally got to break fast after over 72 hours of only consuming water. Many people reading this might be wondering why on earth anybody would want to starve themselves for three days, and the answer to that question is simply curiosity. Sure, there are many theories out there that the occasional fast is good for the body, but none of us participated for health reasons. As Felix put it, “I have eaten food every day of my life, so I want to see what happens when I stop eating, I want to know what it feels like”. All of us expected to experience extreme hunger, but this was not the case. When I woke up on the final day, after 56 hours of not eating, I felt fine. I didn’t feel hungry, though I felt a little sleepy and a little weak. Instead of hunger, the main challenge I faced was boredom. I love to eat, and when traveling especially, eating is one of the main activities of the day. If you are bored, you eat. If you want to splash out and spend some money, you buy food. If you want to get comfortable you make a cup of coffee. So instead of being hungry, I found myself with an intense desire to taste something. The whole fast my thoughts kept returning to this package of chocolate chip cookies I have sitting in my tent. Just one cookie, my mind would say, just one bite, let it crumble in your mouth, let it slowly be softened by your saliva, taste that delicious refined sugar… mmmm. This morning though, after 72 hours of not eating, I was beyond ready to break my fast. We started breakfast, literally break-fast, with a beer as we wanted to know what effect a single beer would have on us with a three-day empty stomach. The effect was instantaneous and dramatic. We were wide awake, and feeling like a couple of giddy school kids in a few minutes as the first sugars, carbohydrates, and alcohol entered our system. For breakfast we had yogurt and honey mixed with papaya, banana, and six fruits. We also had a couple of slices of soft bread with butter and cheese. From the first bite to the last we were savouring, relishing every morsel – every gorgeous calorie – that we took in. Five minutes after finishing our meal, our bodies had another message for us: go to the bathroom. Afterwards we just sat there, reveling in the energy and the awareness throbbing through our every cell. Lunch we had a bit of a banquet laid out with fancy scrambled eggs, coffee, tacos con carne, fried prawns and of course some of those chocolate chip cookies. Dinner we had at a mexican restaurant down the road. It was an interesting experience, but it’s too early to say whether or not I’ll do it again in the future. The easiest way to get to La Paz from here is to simply take the highway the whole way. I will not be doing that though. Instead I will be going off-road into the mountains to visit the Mision de San Javier. When I first crossed the border into Mexico, literally at the crossing, I met a guy who rode his bike down Baja California back in the 1980s, and he told me, that of all the old missions scattered around Baja California the one not to miss is Mision de San Javier, 40 km outside of Loreto. He described it as an interesting and incredibly beautiful place and ,seeing the wistful smile on his face as he recounted the tale, I made a point of it to mark Mision de San Javier onto my map. One month later, I am going make good on my promise to him to go and see it. After visiting the mission, it will be another day off-road as I cross the Baja Peninsula for the fourth time before I get back on the pavement. From there, I cross the peninsula for the fifth time, passing through Ciudad Constitucion. Though I am leaving The Germans (who are still waiting for their new bike rim) it is quite possible that I will be joined by Marie and Johan on my mission to the mission. Marie and Johan are two Swiss cyclists riding the Pan-Americana on their way down to Argentina. You can check out their cute website here: http://www.lego-voyageurs.ch/ though some knowledge of the french language would be helpful if you want to read their blog. Once I get to La Paz, I will need to decide whether or not I want to go out of my way to visit Los Cabos to the south. Despite there being a micro-brewery down there, I am still 50-50 on whether or not I want to visit the tourist mecca at the southern tip of this peninsula. Though I am not in a rush, I am starting grow a bit weary of the gorgeous desert landscapes and beaches of Baja California. More and more I am looking forward to making the Mexican mainland.